What Kodak camera is this? Discussion in 'Classic Manual Cameras' started by Ian Rance, Dec 13, 2011. Reading about the Cumberland spaceman, the photographer used 'a Kodak SLR' which he is seen holding here http://www.cumberlandspaceman.co.uk/wp-content/uploads/Recreating-the-Cumberland-spaceman-photo.png but I own a few Kodak SLR's and neither the case nor the black leatherette around the prism looks like any Kodak I know. Does anyone recognise it? Here is an older shot http://www.cumberlandspaceman.co.uk/wp-content/uploads/Jim-Annie-Templeton-camera-spaceman-photo.jpg and it almost looks like a Voigtlander with those shaped knurls. Looks a lot like a Contax S or one of its descendents. Captain Jack has a fair bit of information about them here. Pardon my ignorance, but who or what is the Cumberland spaceman? That looks spot on Jean - the Kodak description was wrong I could tell. John, the Cumberland spaceman is an enigma - a muscular and strangely positioned humanoid that appeared in a photo taken in Cumberland, UK in the 1960's but was not seen with the naked eye. It looks a menace to me and the same type of suited humanoid was also seen on a rocket range in Australia around that time. In the second photo it kind of looks like it has the Pentacon tower logo on the prism, so it's probably not the original S, but a later D or F. But it's definitely something from that range of cameras. 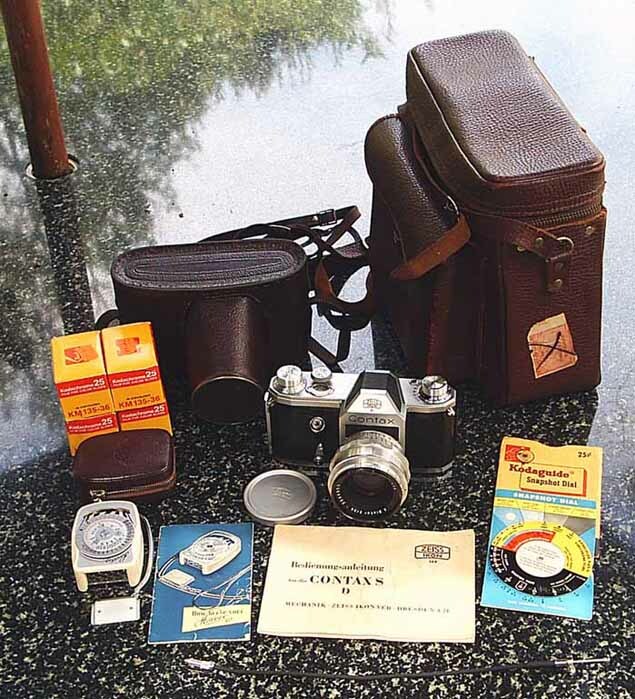 The camera used was not a Kodak, but one of the East German Zeiss Jena Contax/Pentacon F series with large wind-knobs. 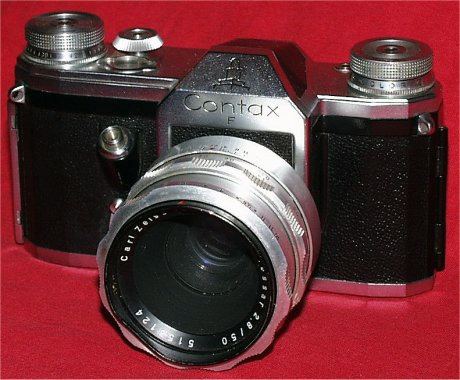 (For details of this camera series see: http://www.praktica-collector.de/100_Contax_F.htm) The Pentacon F was the decendant of the Contax S, an early series-production SLR, first released in 1950. I use a 1951 Contax S, so I am quite familiar with this design. As the camera used in the spaceman picture has large wind knobs it can't have been made before 1956. One of the features of the Contax S/D/ Pentacon F is that it has a primitive plain-glass view screen (Steven's Screen) for focusing, which makes the finder image quite dim and only really sharp in the centre. The viewfinder image is quite restricted and shows approximately 70% of the full 24x36 mm frame of the 135 film format. Any modern SLR would have a brighter viewfinder covering at least 92% of the frame. Therefore an object at the very edge of the frame may not be seen before taking the picture. Another limitation is that the Contax/Pentacon F also does not have an "instant return mirror", so once the photographer presses the shutter release the viewfinder goes black and stays that way until the camera is re-wound for the next shot. The lens appears to be a Zeiss Jena 58mm Biotar with a maximum aperture of f/2.0. These were (are) superb professional quality coated lenses of a double-Gauss design and easily match a modern DSLR lens for image quality. 2/58mm Zeiss Biotar's are highly sought-after today and can fetch hundreds of pounds in good condition for use on DSLR's. With such a top-quality coated optic I really doubt that the "spaceman" image is a result of internal reflections or an optical flaw, particularly as the rest of the images on the roll came out properly exposed and without artifacts. In conclusion, if an object or person appeared at the edge of the frame immediately before the shutter was fired or during the taking of the image, the photographer may not have known about it. I second Peter's ID. I'm pretty sure of the Biotar lens as well. Did I mention that I personally like the Contaxes a lot? I have since found a matching 2.8/35 alloy Flektogon and 4/135 alloy Sonnar for my Contax. Very pleasant, if a little slow to use. "The picture and negative was exhaustively examined by Kodak’s experts for any signs of tampering or hoax but none could be found. They then offered a reward of free film for a year to any person that could solve the mystery as to how this figure got into the picture. To this day the reward lies unclaimed." So Kodak confirmed the image was not a composite. "Stranger still, Jim was visited by two strangers wearing dark suits who claimed to be Government officials, who drove a dark Jaguar. They pulled Jim out of his day job to take them and show them the site where the photo was taken. They asked Jim specific questions about the weather, had he seen any local people or animal activity on the day. They then tried to get Jim to admit that it was all just a big hoax, to which Jim refused to admit. It was at that point they drove off and left him and it was a five mile hike back to the firestation where Jim worked." That "spaceman" outfit looks to me like an old-fashioned radioactivity HAZMAT suit, complete with mica-coated visor. I would say the guy in the HAZMAT suit was searching for something toxic that fell off a missile or a bomber, or just got lost from the UK's incredibly dangerous and dirty nuclear power industry. He hears voices and stands up to see what's going on, see's a guy with a camera and quickly ducks down, squirming away through the peat. Sounds more plausible than an alien or "spaceman" to me. Then two goons from British Nuclear Fuels, or the Ministry of Defense, or some other dodgy outfit arrive to scare the photographer into silence. Standard-operating-procedure from what I know of the MoD, the nuclear industry or the 'things-that-go-bump-in-the-day' crowd. Solved, with not an alien in sight. "It's alienation, not aliens, stupid." The site of this incident is on a hill apparently. It's very plausible a man (oddly dressed) ran up to the top of the hill (from the other side) to get a better vantage point to see something - ended up in the shot - ran back down and wasn't seen by the photographer. As mentioned, lacking an instant return mirror, and having knob wind, it would have been possible for something to momentarily enter the frame without the photographer noticing it. Peter I can't argue with most of your assertion, but I do believe I see something a little different. I think it's a rear view of the "alien" and that is not a visor on the helmet. Just sayin'. 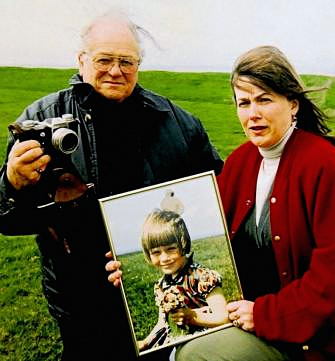 I have not heard any confirmation of the Kodak experts story, nor any others told about the spaceman photo. Numerous paranormal investigators have interviewed Mr Templeton. None to my knowledge got the negative, or either of the two others shot at the time. One of them at least exists. I captured this from a video shot in Mr Templeton's house. It was lying on a table by his (Pentacon L) camera. It was lying at an angle, so I had to straighten it a bit, then enhanced contrast. Note behind the girl's head. Thank you for the camera info. I have never seen any Pentacon's for sale - but they do look interesting. Peter and JDM - wonderful collections - well done for aquiring them. 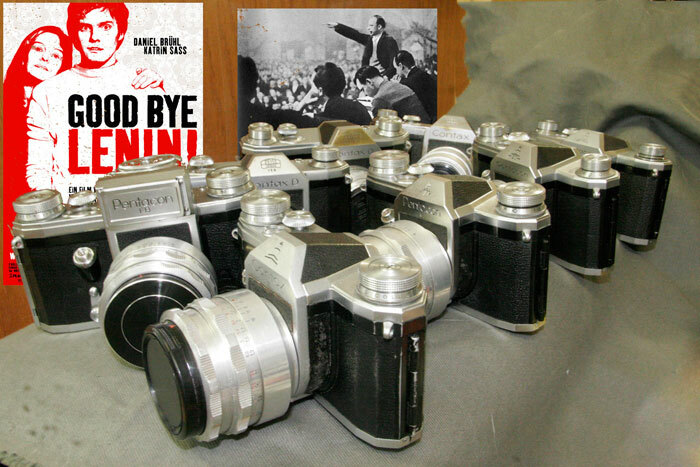 I have a some of the Kodak SLR's and they are nice too - but very different to the Pentacon models. The Spaceman is interesting to me but as we cannot go back and experience that moment again the actual facts will never be known I fear. I do think that we are looking at the back of the figure though. I am interested in the unknown and so many odd things have been sighted over the years it makes for interesting research. Even if none of it is 'alien', some of what has been seen is unlike anything else recorded so at the very least there is some uncharted things happening around us. I have seen a few odd things and even when I point them out to strangers they too have no idea what they are. I had a smokeless bright red ball drift low over my area one windless Summer evening. Other people saw it too - I wish I could have videoed it. change in the field of view. Perhaps there was a major upgrade along the line? I like the Men In Black part of the whole thing. What a load of old shirt! White shirt flying up on the wind, that is, to be snapped by Lucky Jim. "My first serious camera was a Pentacon FM. It was 45 years ago but I'm prepared to state that the screen coverage was a lot more than that. The screen was also fairly bright and I think there was a field lens on top of the ground glass. When I finally changed to a Pentax Spotmatic, the screen was a lot brighter but I don't remember noticing a change in the field of view." I have since bought a 'Pentacon FBM' (http://www.praktica-collector.de/107_Pentacon_FBM.htm), and have compared it to the 'Contax d' I already have (http://www.praktica-collector.de/091b_Contax_S_2nd_var.htm). Although the Pentacon FM now sports a proper condenser field lens and in the case of the 'FM' model, also a central split-image focussing aid, it still has a massively restricted view in the horizontal plane compared to any 'modern' SLR. So my previous statement regarding the restricted horizontal field in the viewfinder image holds true. Therefore the 'narrow' image through Jim's Pentacon FM viewfinder in vertical mode, resulting in darkening towards the frame edge on the long side, may not have clearly shown whatever the white thing is above Annie's head in the moments immediately before he pressed the shutter release, turning the viewfinder image completely black until Jim wound-on the next frame. And Dave Henderson, your "white shirt flying up on the wind" story fails to explain the heavy-handed response from the self-identifying 'government' goons in the Jaguar car who dumped Jim 5 miles out in the middle of nowhere. That action was clearly an overt threat to the photographer's personal safety! Such an organised effort to scare Jim was driven by an imperative. We can only speculate as to what that imperative was, but the response of the 'government' suggests that they considered it important enough to dispatch a pair of thugs who were familiar with police methods of interrogation, and who then attempted to brow-beat Jim into either changing his story, or silence. Why would anybody go to such extreme lengths to intimidate a photographer, unless they had something to hide?